What I learned from being "Sister of Joe"
A fertile revolution against the status quo carved the social landscape of the 1960s. The events that riveted us to the TV mirrored another experienced in our home, albeit one with a quieter face. Joe, my youngest brother, was born with Down's syndrome. In the '60s, mental retardation wasn't cause for flowers or marches on the street. It was hush-hush news. The scientific explanation for Down's syndrome echoes as a fait accompli: A genetic abnormality occurs in mitosis with an additional 21st chromosome, accounting for an array of developmental and physical challenges. As a kid this meant little to me, beguiled as I was by the poem my mother had placed next to Joe's crib: A meeting was held far from the earth. It's time again for another birth, said the angels to God above. This child will need much love. I was in the second grade when Joe was born. My parents didn't learn of Joe's diagnosis for months, but they weren't fools to the obvious. Joe's "difference" settled over the family like a dense fog. Dad, a special agent for the FBI, assumed a deeper gravitas. Silence burrowed into our already quiet household. My mother shed tears over dessert. We kids went underground. Finally, my teacher, a concerned nun, rang one night, asking my mother why I'd become so sad. Her phone call instigated what would become the first of many Conlon Family Meetings, presided over by my mother. We had reached the official switchback going from Life Before Joe to Life After Joe. In the world of the 1960s, my brother's birth was a tragedy. Our mission, if we chose to accept it, was to discover what the tragedy masked. Instinct would be our guide, as would the radar bleeping from our hearts. 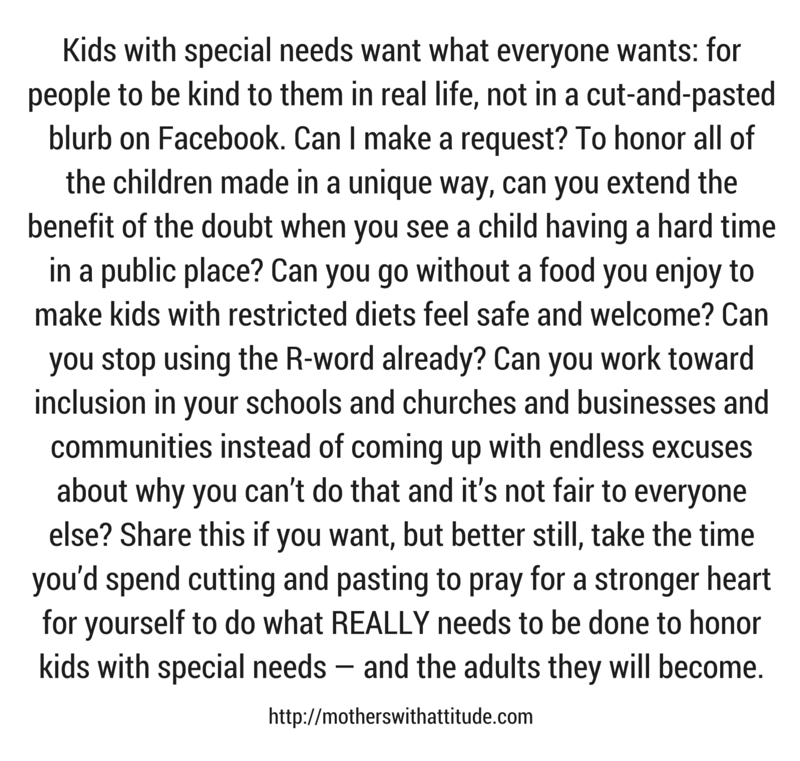 I don't want to romanticize the notion of mental retardation. Such oft-called "accidents of nature" can be cause of real heartbreak. The boy you envisioned as star quarterback learns to tie his shoelaces at age ten. The girl who might teach physics instead boards the bus for special school. Opportunities have widened in recent years for people like Joe. Still, these children are paradigm busters. You don't hear them mentioned in wedding vows. And mothers and fathers who devote their lives to raising these kids worry about their care when the parents are gone. But I was Joe's sister. SOJ. Sister of Joe, the person who helped him brush his teeth and get into his pjs at night. I was the pathologically shy kid and he the severely retarded one. Together we made our way into the world. Joe spoke with a quiet animation. I learned to understand him by peering into his eyes, deciphering his mono-syllabisms using a combination of intuition, pantomime and later sign language. I discovered he could learn words using lyrics so I'd play the piano and he'd sing along as best he could. Ours became a language similar to music, enveloping the heart's larger truths so often constrained by human words. Soon enough, my shyness morphed into the palpable hope of learning to scatter joy the way Joe did. My brother was the king of collapsing space and time. After school he'd stand on our corner sidewalk, and wave to car after passing car. The drivers, coming home from work, would crack a smile, some rolling down their window and yelling hi back. Joe approached people in restaurants, markets, theaters, ball parks, surprising them with his eager handshake and clumsy hello. Nobody was a stranger to Joe. My father, the special agent, was a gravely quiet and sometimes a cynical man. After biting into his sandwich one day, he quipped that normal people were really the retarded ones. His work in the shadowy underworld no doubt contributed to this sentiment. But I knew what my father was saying. Joe held the mystery of love that melts the walls we "normals" spend our lives constructing. Joe made sense of nonsense by teaching us how to live in the moment. The human heart is wired with an innate intelligence. How easy to forget this when we are preoccupied with pursuing "intelligence" of another kind. These days when fear of the other so pervades our culture, I am grateful for the greatest lesson I learned from Joe: our world is made by our reaching out and saying a clumsy hello.